ONE A pair of flat espadrilles ranks high on my must have list for the summer. // TWO Garance Dore teamed up with Rifle Paper Co to create the chicest stationary collection ever. // THREE An updated classic. // FOUR Nars lipstick in niagara is my go-to color lately. // FIVE A stripped shirt in a fun summer hue. 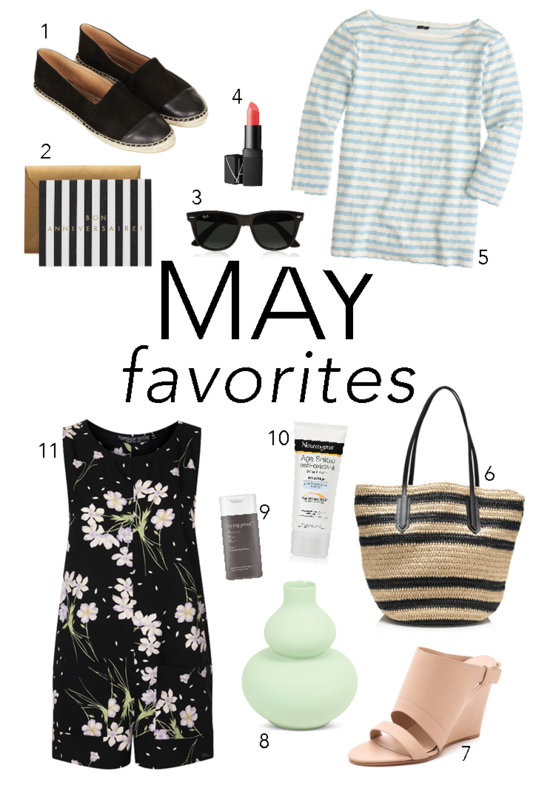 // SIX Perfect for the beach of the farmer's market. // SEVEN Totally lust worthy mules. // EIGHT Pair with orange blooms for an unexpected look. // NINE Saving me from bad hair days, everyday. // TEN Necessary for any outdoor adventure. // ELEVEN Floral romper perfection. I want SO bad to try Living Proof. Is it worth the extra bucks? Yes, I love it! It leaves my hair incredibly soft and still adds the volume I need.